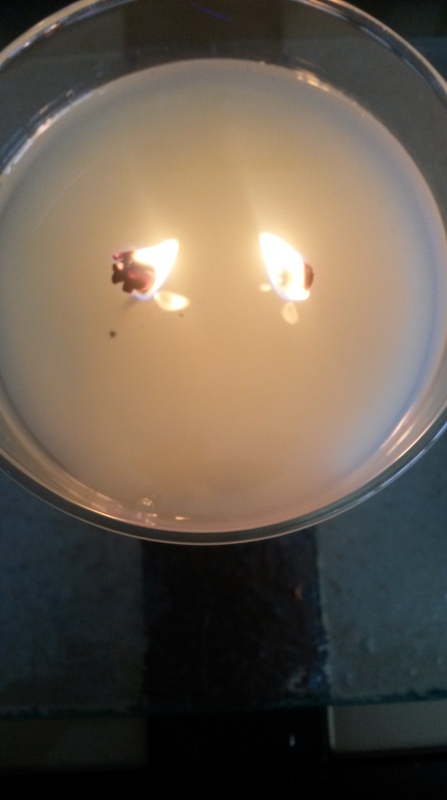 Once upon a time, I wrote a blog post on the Charmed Aroma candles I discovered online. Unbeknownst to me, it would become my most popular and most searched review ever. To this day (over a year later) it is still the blog post that gets the most hits. People continuously comment on it and some days I’m tempted to just delete it because I don’t want my blog to be popular simply for one post I made months and months ago. That being said, I am always completely grateful and thrilled to know people are actually reading something I blogged about even if it was just a silly candle review. If you’re one of the rare few who haven’t searched for a Charmed Aroma candle review online you can find mine here. And for those of you who are wondering what the heck is a Charmed Aroma candle? Let me give you a quick and dirty overview. 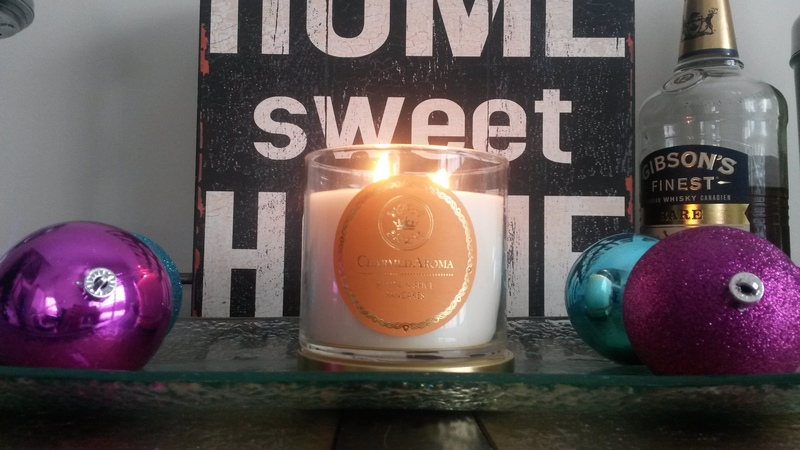 Charmed Aroma is basically a company that produces soy based two-wick candles that come in several fragrances ranging from Hawaiian Breeze to Vanilla Crepe to their limited edition scents which are typically seasonal i.e. Pumpkin Spice Pancakes or Vanilla Macaron. They come in either the standard glass holder or the more expensive and luxurious looking crystal holders. Inside each candle contains a ring with a code. 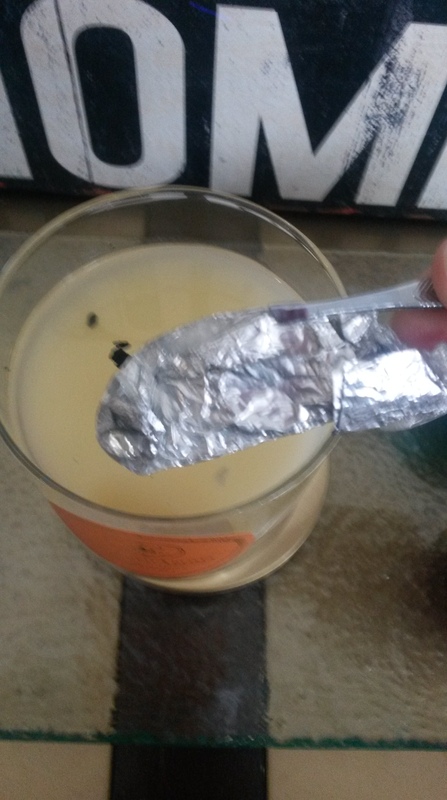 Once you burn down your candle, a small tin foil wrapper will be visible. Within the tin foil contains a small plastic baggie with your ring and appraisal code. The idea is simple, you get the ring and the code, go online to Charmed Aroma and enter the code in their appraisal section. Once the code is entered you’ll receive their estimated value of the ring. All rings are valued (according to them) any where between 10-5,000 dollars. It is important to note, that although Charmed Aroma gives you an estimated value, in my opinion, it is highly unlikely the ring you’ll receive is actually that much. Most of the rings that I’ve seen online and in person, are typical costume jewelry. Sure they look pretty and in some cases could definitely pass for a more expensive ring but at the end of the day, it’s very unlikely that your $500 ring is actually worth $500. In my last Charmed Aroma review, I had bought the Vanilla Crepe candle as an early birthday present to myself. It was just something fun and new to try out and I ended up really enjoying the whole process. The candle arrived securely packaged and once I lit the wicks, my entire house was filled with the most delicious scent ever. I’m a HUGE sucker for a good Bath and Body Works candle. Honestly, I could go broke during Autumn and around Christmastime in that store and much to my surprise I found myself loving the Charmed Aroma scent so much more than any other candle I’d purchased from B&B. This year, my step-mom got me a new candle for Christmas so naturally, I thought I’d write out another more recent review of the company and their candles. Now, keep in mind, I’ve already gone through the ring process once before and as much as I enjoyed it, I do have some reservations on the actual value of the rings as well as the fact that you don’t get to choose your ring size, however; all that being said, it’s still a fun experience even if you’ve done it before. Charmed Aroma was a relatively new Canadian company just over a year ago who burst into popularity thanks to ads on Facebook and Instagram. Back when I reviewed them for the first time, I mentioned how I really wanted to see more jewelry options; whether it be necklaces or bracelets or earrings. I thought that being able to chose what form of jewelry you were going to get would be a neat idea; especially since you weren’t actually able to choose your own ring size and let’s face it not everyone enjoys wearing rings. Well, I’m happy to report that it looks like Charmed Aroma got the message because now you’re also able to purchase hidden necklace candles so it seems like they’re on the right track in terms of listening to what their customers are requesting. I had also stated that perhaps having ‘seasonal scents’ would be a good idea too. 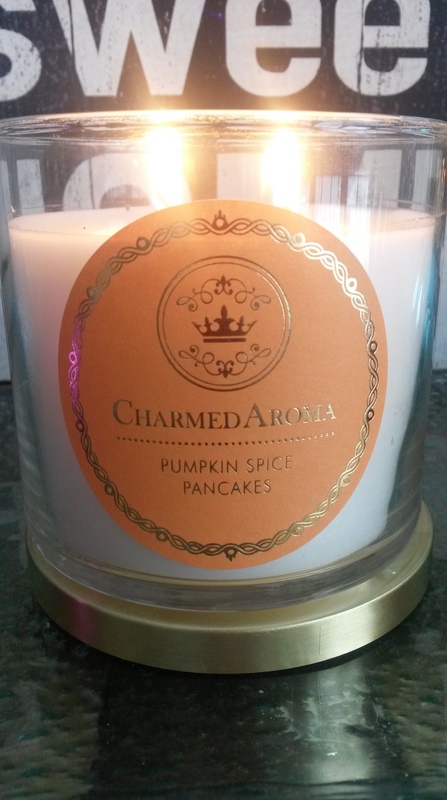 Now, I’m not saying the staff at Charmed Aroma have been reading my review of their product or anything but I can’t help but notice that now they do offer seasonal scents like the Pumpkin Spice Pancakes I received for Christmas this year. It would also appear that they’ve jumped onto the ‘bath bomb’ trend as from looking at their website, I can now see that they offer hidden rings inside a luxurious bath bomb. I won’t go into details on these items they now produce as I, myself, have not tried one out but let me tell you as someone who just recently discovered how wonderful bath bombs are, I most definitely want to order one of these bad boys ASAP! Okay, okay, Carly, enough rambling! Let’s get back to the candle you just burned. So like I said, I received the Pumpkin Spice Pancakes scent as a Christmas present and it was one of the tastiest smelling candles I’ve ever had. Seriously! There was just a hint of pumpkin mixed with the scent of maple and vanilla. Just enough that it was pungent without overpowering your senses. 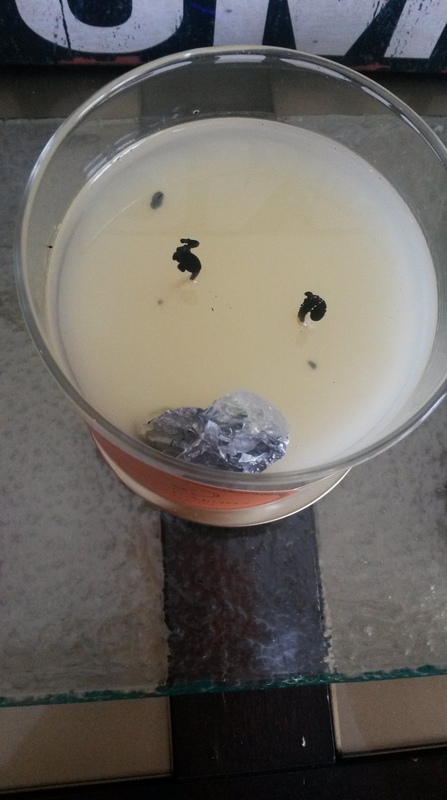 I lit the candle and let it burn for roughly 3-4 hours before being able to see the top of the tin foil wrapper. Using a pair of old tweezers I dug around and was able to pull the package out freely. Now I cannot stress this enough! BLOW OUT THE CANDLE FIRST! The amount of videos I’ve watched where people are digging around in a lit candle never ceases to amaze me. Seriously. If you want to potentially get burned then by all means go right a head but if like me, you care about your skin, blow the candle out first. You can always relight it when you’re finished. It’s commonsense here people! Now, back to the ring…I like to use a pair of old tweezers to pull the packages out. Wax can be tricky to get out of clothes or off objects so I wouldn’t recommend using your brand new Sephora tweezers you might have just gotten for Christmas. 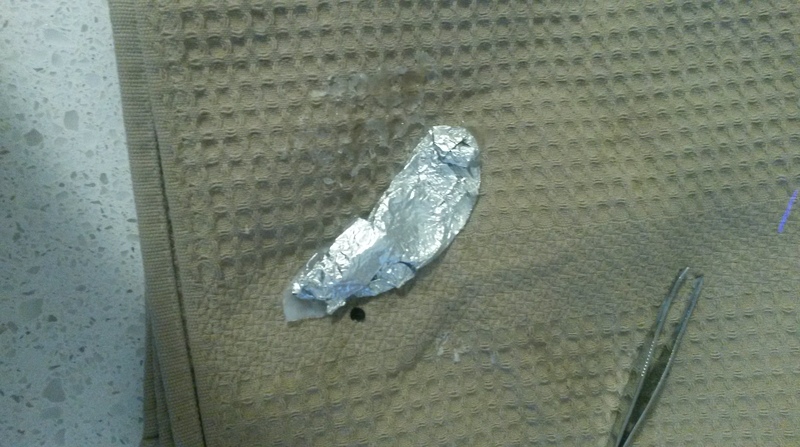 After I pulled out the tin foil, I wiped it off with a cloth to remove the excess wax. Mind your fingers here as well. The foil was just submerged in hot wax so obviously it’s going to be a little warm to touch. Once it’s cooled, I simply opened the foil which revealed the plastic baggie containing the ring. In what I like to deem as a ‘rookie mistake’, I took the ring out of the plastic baggie and immediately began to clean it off. It’s hard for the bags to stay perfectly sealed so chances are, there’s going to be some wax on the ring itself. Well, once I did this, I realized I hadn’t removed the appraisal code yet which apparently is not waterproof. So needless to say, I currently do not know the ‘value’ of my ring yet. But never fear! Charmed Aroma allows to you send them pictures of your rings if in the event your ring does not have an appraisal code attached or if like me, you accidentally wash it off. I’ve received an email back stating that it may take 2-3 business days for my ticket to be answered so once it is, I will update this post with the value of my ring given to me by Charmed Aroma. Also, yes I am aware I have really unattractive hands. Apologies! And there you have it! 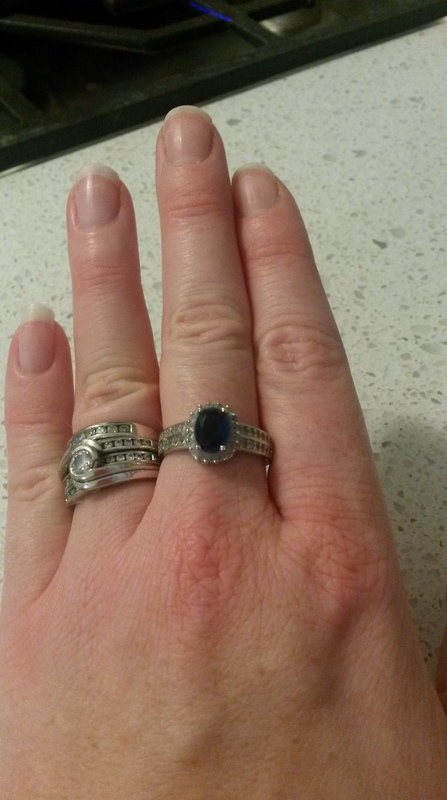 My pretty little sapphire double band ring. 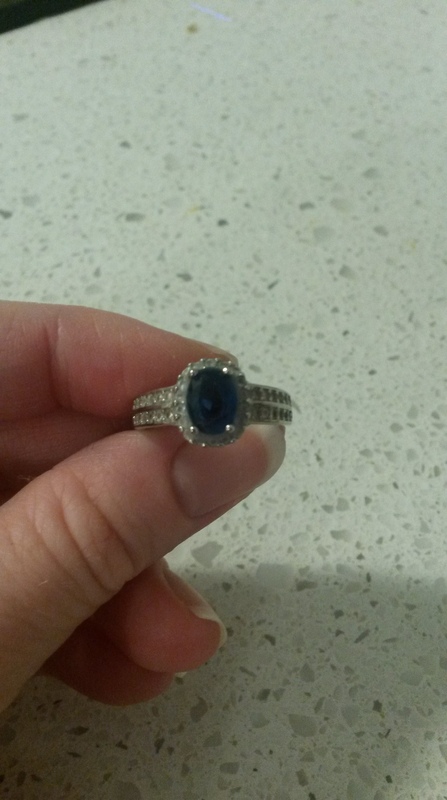 Funny enough, my other ring I received from Charmed Aroma also had a sapphire stone. However; this one definitely fits my fingers better and I like the look and shape of the stone on this one more. I think the major thing to keep in mind when ordering one of these candles, is it’s like playing the lottery. Just because you buy a ticket does not mean you’re going to win the big jackpot. And just because you buy a candle, does not mean you’re going to be the ‘chosen one’ who receives the $5,000 ring. I’ve read and allowed (almost) every comment I’ve received on my first review of this company and I think the majority of people missed the point. They all seemed to assume the rings they were getting were going to be valued in the hundreds when in reality, they’re all just really cute costume jewelry. In my opinion, if you want an expensive ring, don’t go spending $30 on a candle assuming you’re getting a fancy ring out of it. Treat yourself and get yourself the expensive ring you want. 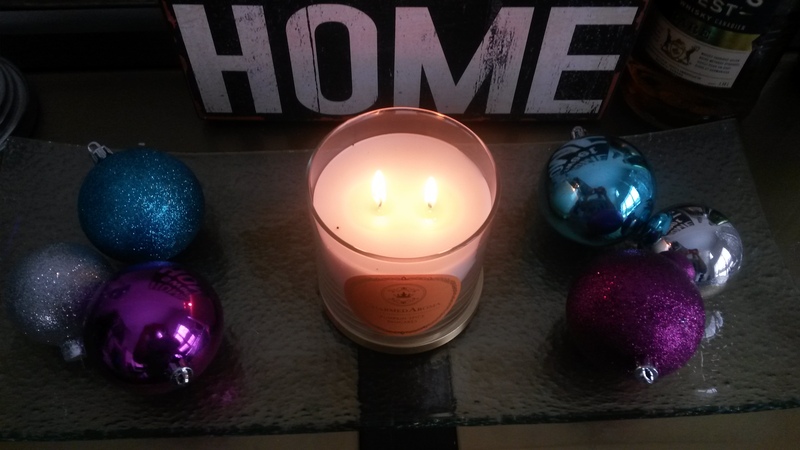 But if you’re like me and just enjoy the delicious smell and ambiance candles provide, plus you want a little treasure hunt, then this company is definitely worth checking out!